I tend to actively avoid Steven Seagal films like the plague, and realize intermittently that I do in fact enjoy certain ones from back in the day. He’s made a ton of trash, no doubt, but the clouds part every now and again, for select occasions like Under Siege, The Glimmer Man, Above The Law, Fire Down Below and the snowbound On Deadly Ground. The main marvel in this one is an incredibly hammy Michael Caine as the mustache twirling villain, a Big Oil maniac who has his amoral sights set on sacred land belonging to Inuit tribesman. 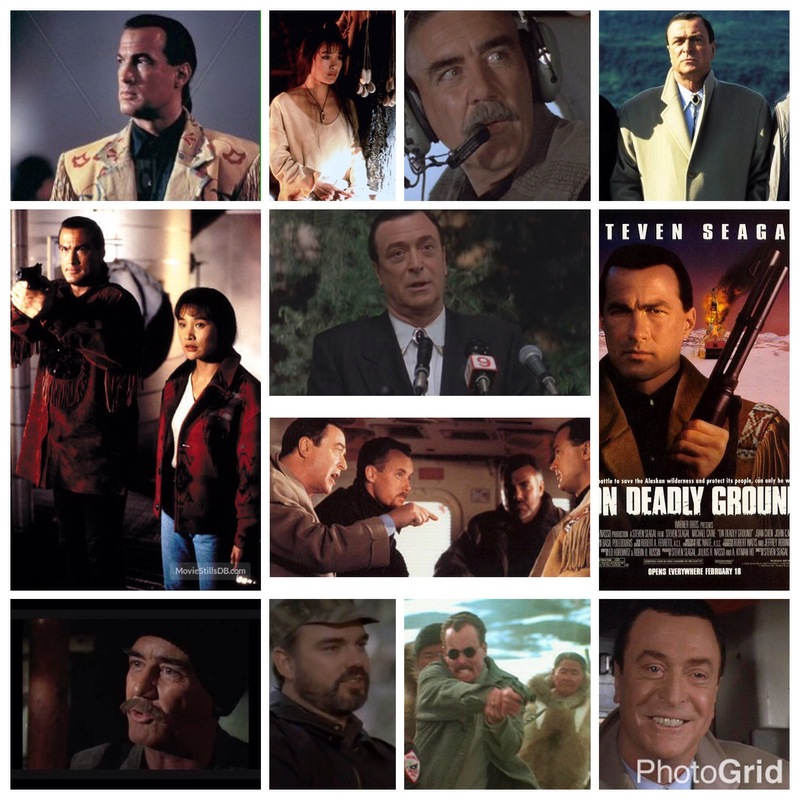 Seagal plays yet another martial arts trained badass who takes it upon himself to bring down Caine, his nefarious capitalist plans and the violent mercenaries he has hired to wipe the land of indigenous natives. It’s as silly as silly can be, right down to him falling in love with a beautiful Inuit girl (Joan Chen, actually Chinese), but enjoyable on its own terms when you look at the solid choreography, stunts and impressive location work. Also, the roster of villains is too good to pass up, starting with Caine’s outright, wanton psychopath. We’re also treated to the Sergeant himself, R. Lee Ermey as a merc with a particularly salty attitude, John C. McGinley over-playing one of his patented schoolyard bullies, and even Billy Bob Thornton shows up, adding to the sleaze factor. Watch for cameos from Mike Starr, Michael Jai White and an unbilled Louise Fletcher as well. Seagal directed this himself, so it’s essentially one big vanity piece where he gets to play Dances With Wolves for a couple hours, but the trick is to see the unintentional comedy in that and enjoy it. Seagal is one of those goofs who I am not a ashamed to say I am laughing at, not with. Caine is the real prize here, and his merry band of assholes. An action flick is only as good as it’s antagonist, and this guy is bad to the bone in hilariously over the top ways. A big dumb flick, nothing more, nothing le- well maybe a little less in places, but fun in other spots nonetheless.